Once You Have Installed Your Remote App, There Are A Few Details You Must Get From Or Set In Kodi First! Media Center Name: The name you will give to the media center you are using. This name will be only for identification purposes, so in theory you can name it anything you like. IP Address: In here, you need to input the IP address of the machine running Kodi, which you wish to control from your remote app. Username: This username can be found (or set) within the Kodi settings, see image below. Password: This password can be found (or set) within the Kodi settings as well. Port: The port used for communication between Kodi and your remote app. Usually set to 80. To know the Username and Password (or to set them), from Kodi/SPMC Etc... homescreen head to System->Settings->Services->Webserver. In most cases, the Username is set to “kodi” and password is intentionally left blank. In here you can also find what port is Kodi using for communication. You can use the default username, password (none), and port 80 or set them to your liking. Customizing them is better for security reasons. But whatever you have here should be used exactly to configure your remote. 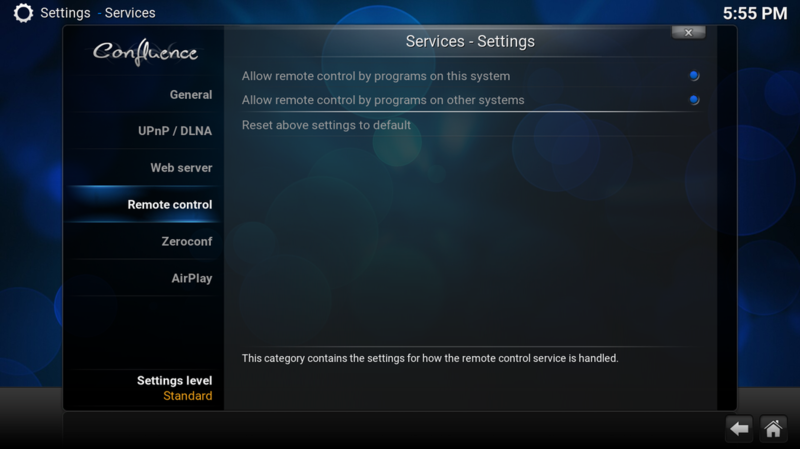 Make sure to allow remote control of Kodi from other programs. This can be done from the Remote control option, right below Webserver. Make sure both buttons are checked as in the image below. 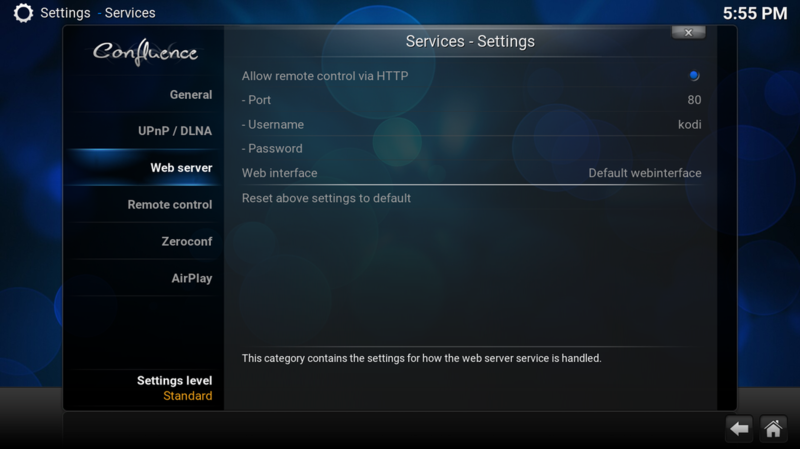 ​Web Server: Allow Remote Control & Note/Set Username, Password And Port. Remote Control: Allow Remote Control Programs On This And Other Sysyems. IP Address: Go Over To System, Then Down To System Info! Note Your IP Address As Shown. Ok, You Should Be Up And Running, In Theory All Remotes Of This Nature Work On The Same Principle And Require The Same Setup! Hope This Guide Helped You Out. If Using An Aeon Nox Skin (Merlin Jarvis) Then Simply Click SYSTEM On The Main Menu! 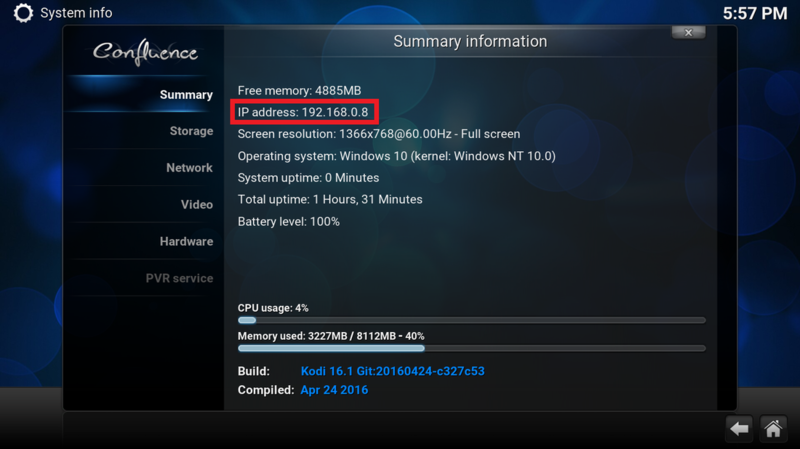 This Will Load Up The Kodi/SPMC Etc... System Settings Window.